Where the desert meets the ocean, the Red Sea is a fusion of ancient history, crystal-clear blue water and breathtaking natural wonders. A favourite among avid divers, the Red Sea is well known for it’s breathtaking exotic seascape and miles and miles of reef-lined coastline. With azure blue waters, sprawling reefs, abundant marine life, and coral gardens the Red Sea is ranked as one of the world’s best diving and snorkelling destinations. The pathway between Asia and Africa, the Red Sea is a truly awe-inspiring cruising ground. Considered Egypt’s “Garden of God”, there is a wealth of underwater life with over 1100 species of fish, 40 species of starfish, 200 species of coral, as well as dolphins and sea turtles. 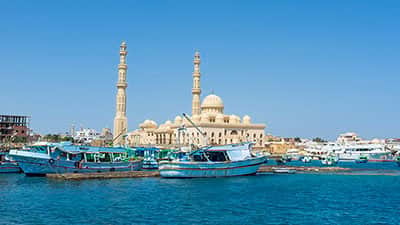 Check out the busy seaside town of Hurghada, or take port in quiet Bur Safaga for a day excursion to the Valley of the Kings. Cruise across the Red Sea to cosmopolitan Juddah where you’ll find a plethora of shops, souks and restaurants. Meander along the footprints of ancient history in Old Town with it’s crumbling buildings and architecture. Or simply soak up the sun in secluded bays and sandy beaches framed by towering mountains. There are two seasons; a relatively mild winter from November to April, and a hot summer from May to October.